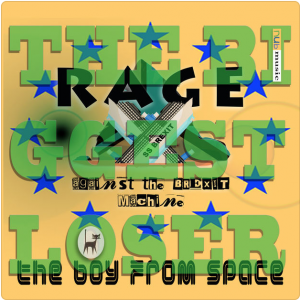 Electro Indie band The Boy From Space have penned a ska track about a ‘Leave’ voter that has possibly changed their mind based on the truth slowly coming out in the press. This is the start of RATBM’s 2018 release schedule with a new single, album and gigs to come in 2018 on Nub Music. The song features the melody line of the hymn “Dear Lord and Father of Mankind” segued with ska in an unholy cocktail fit for a Prime Minister of Sound. The lyric to “The Biggest Loser” is a bittersweet and ironic throwback to a fictional golden age before the EU “took our country away” …. where did it go to though … ?? ?